Mainly used to create or pack ZIP and ZIPX archive files, it can also be used to unpack all these files, along with LHA, LZH, RAR and BZ2. It can be used to decode files such as HQX, B64, and UUE. Provides support for files such as ARC and ARJ, especially when the appropriate external drive programs are installed. It provides 128-Bit, and 256-Bit key AES encryption alongside the less effective PKZIP 2.0 encryption that were more popular in the earlier versions. It works with Windows, IOS, android, and Mac devices, it also comes with Email companion, system utilities and courier features. It provides solid encryption for archives, and also works with top cloud storage and social networks for proper encryption during file sharing. Comes with a revamped user interface that is very intuitive. It provides a much faster zipping service when compared to the in-built Window utility. It comes with a Plugin for Microsoft Outlook users. 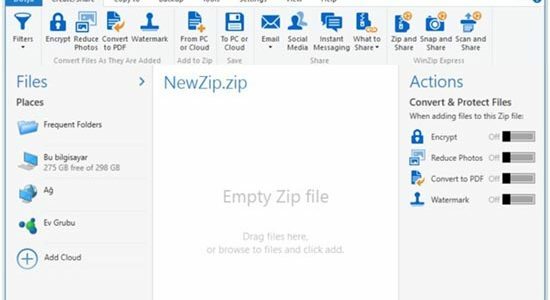 It comes with the ZipSend feature that allows huge email attachments to be zipped and transfer. It can convert from Microsoft word to PDF. It has the ability to create self-extracting ZIPs, hence the recipient of files don’t need any Utility to extract the files. Comes with high compression ration especially in the LZMA and LZMA2 formats. For the compression of GZIP and ZIP format files, the program produces a compression ratio of 2-10% which is far better than those produced by WinZip and PKZip. It encrypts with a very strong 256-AES in 7z and ZIP formats. It comes self-extracting capabilities especially for the 7z format. It comes with integration capabilities with Window Shell. It can handle multiple compressions at the same time, especially in 7Z, GZIP, ZIP, BZIP2, and TAR formats. It can unpack all formats it compresses, alongside other formats like CAB, ARJ, DEB, DMG, CHM, and CPIO. It is quite easy to use, even beginners will face no challenges when making use of its basic features. It comes with several advance options such as the capability to create self-extracting 7Z files, and you can also add a password protection to compress the files. It is free to download, install and use. The compression process can take more time for completion when compared to compression time for main rivals. The compressions that are carried out through this archiver, will require more resources, especially when the compressions are ongoing. support It offers support for all propriety formats, hence there is no need to download third party software to open them. Does not support some propriety formats thus, you need to download the appropriate software in order to open some compressed and archived in 7Zip. Price Starts from $29.95 It is available for free. If you want to compress and archive files for free, it is easier to say that 7Zip is a better option but on a second thought, the software may not be able to open some files in propriety format, which means you need to download the appropriate software to open such files. 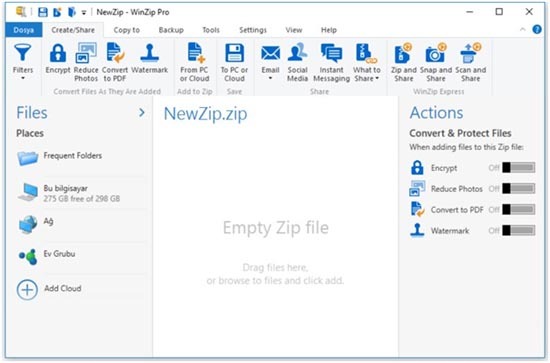 On the other hand, investing some $30 on WinZip archiver can make more sense because you wouldn’t have problem opening files of different propriety formats, this will definitely save you money on the cost of downloading third party software.